It was a glorious sailing day on Eagle Mountain Lake, the kind of beautiful spring day that makes you feel great to be alive. In addition to great sailing, we were treated to a free air show directly above us. There were numerous vintage airplanes, some formation flying, and even an aerobatic stunt plane doing spins, loops, and barrel rolls – and all of it right over the lake. We had a close-up view from the boat. Our sailing day was cut short so that I could go and DJ for a party. The event was celebrating a young lady’s graduation from Nursing School, to be held in an airplane hanger at Hicks Airfield, not far from the Fort Worth Boat Club. I arrived early and set up my DJ booth, speakers and a few simple lights, and played some background music as I began to equalize the sound system. As airplane hangars go, this was a rather nice one. It was new and spotlessly clean, with insulation that helped the acoustics, skylights, and wide overhead doors that allowed the entire front of the building to be open to the beautiful spring weather. It might be just a hangar, but it would sound great, and tonight’s gonna be a good night! A few neighbors from surrounding hangars were there, talking about the Air Show that day, as we were at the airport where it had been based. One asked me if I had seen the show, and I told him yes, and that I especially enjoyed watching the stunt plane. He told me that particular plane was owned by a retired Air Force pilot buddy, and that he kept it just a few hangars down from the party. He had flown with him several times, and said the thrill of doing loops, stalls, and barrel rolls was quite an experience. “Man, I would love to do that!” I told him. 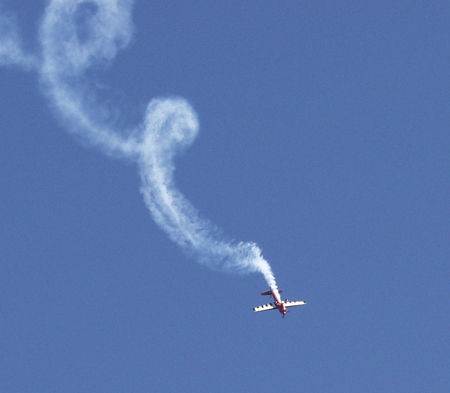 I had done some flying in small planes, and have several pilot friends and clients (Southwest and American Airlines are old Party Machine customers), but I had never done aerobatic flight. So he told me he would contact his friend to arrange for me to take a stunt flight. COOL! I would be looking forward to that. Scratch off one more item on my Bucket List. The caterers and a few guests arrived as I settled in to planning my playlists, and I was looking forward to a fun spring party. I heard someone say “Let’s go!” and looked up to see the guy I had talked to about the stunt plane, waving me toward the front of the open hangar. “Go where?” I asked him. “Flying,” was his quick answer, and I looked to see the stunt plane right in front of us, waiting with the engine running. “You mean right NOW?” I asked. I didn’t want to seem ungrateful, but I had a job to do. I thought his offer to arrange a stunt flight was for some future day, but there he was, ready to fly! He assured me it would just take a few minutes, and the host encouraged me to go. So I programmed some “party primer” background music and set the sound on autopilot, and climbed aboard. It was an old two-seater with sliding glass canopies where the co-pilot sits behind the pilot. The controls were duplicated in both seats, and the instruments were labeled in Chinese. 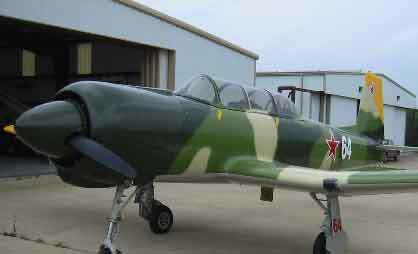 The pilot explained this was a training fighter built in China for the Korean War, among the last propeller fighters built, and they were popular in America as aerobatic planes. He ordered me to strap myself in tightly, as we would be flying upside down. He warned me not to touch the stick, and asked if I ever got airsick. Before I could respond we were off! We were airborne in 30 seconds. We climbed and banked to the right, and headed toward the lake to our West. Soon we were above the Boat Club harbor, and I could see my beloved sailboat Vamos in her slip. We started to climb as the pilot looked back to ask if I wanted to “go weightless.” I shouted “Yes,” and he slowed the plane and climbed at an awkward angle to make the wings stall. We were in that temporary state of negative G-force where you “lose your stomach” as we used to say when we were kids. He turned and asked if I felt sick at all, and I assured him I was good to go. He returned the plane to normal flight level, accelerated, and then started into a roll. Our flight path was like a corkscrew, with the pilot in total control, but I was no longer sure which way was up! It was an amazing sensation. As we leveled off, my host asked again if I felt sick at all, and I again said no. So he accelerated into a steep climb, and never stopped, going all the way upside-down and backwards into a complete loop, then another. The odd thing was that it didn’t feel like we were upside down, or even that we were going very fast, but I was glued into my seat by the G-force. We leveled off again, and the pilot asked – again – about my stomach. I was fine, so he took us into a dive toward the lake. We saw a ski boat below with a skier in tow, who must have been going 40 miles per hour on the water, as we hit “plummeting speed” of around 185, or some similar Chinese number, approaching directly behind the boat. We were closing at an alarming rate. I prepared for heavy G-force when he pulled up, but it kept not happening. I wanted to shout, “Pull up!” but I couldn’t. I had visions of an emergency water landing as we got frighteningly close to the ski boat below. When the pilot pulled out of the dive, I think my cheeks and ears were all the way down on my shoulders. I feel certain that we were not as close to the water as it appeared, but it was better than any amusement park thrill ride. I knew that the water skier had a pantsload after seeing us that close, and when the G’s released my face I couldn’t help but laugh out loud. When the pilot looked back, I proactively declared that my stomach was fine, but the ski boat guys were probably pretty nervous! Another banked turn and we landed back at Hicks, and taxied a short distance to his hangar. We stopped, hopped out, and pushed the plane backwards into the hangar, jumped into a golf cart, and returned to the party. Total elapsed time: 8 minutes 20 seconds. As always, a great party ensued. This entry was posted on December 22, 2009 at 1:34 am and is filed under DJ Stuff, Weird Things at Parties. You can follow any responses to this entry through the RSS 2.0 feed. You can leave a response, or trackback from your own site.